Although the news regarding the horrific physical and emotional impact of bed sores (also called decubitus ulcers, pressures sores or pressure ulcers) surely is on all respectable medical professionals radar screens, bed sores in nursing homes and hospitals continue to plague individuals in all demographics. In order to improve patient care, bed sore prevention must be a priority at all nursing homes and hospitals. Should a bed sore develop, staff must be diligent in identifying the wound as quickly as possible an implement the use of medical equipment such as pressure relieving mattresses and other pressure relief devices such as heel protectors to prevent the wounds from advancing. When bed sore are not timely treated, the wounds may progress and become an advanced stage bed sore. 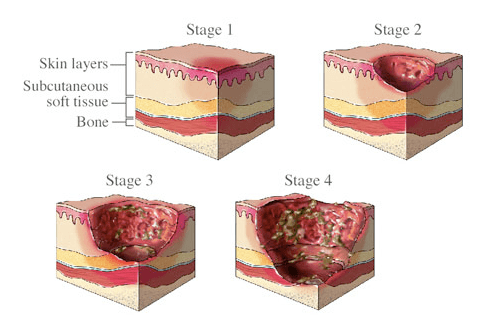 A stage 3 or 4 bed sore typically requires more aggressive interventional medical treatment may be required such as surgical debridement, flap reconstruction or a diverting colostomy may be necessary. By the time significant medical treatment his utilized, many patients are already suffering from complications such as: osteomyelitis, amyloidosis, gangrene or sepsis. In addition to the pain that accompanies bed sores, the medical complications may claim the life of the person. In my practice, we commonly represent families in wrongful death lawsuits for people who have developed bed sore during an admission to a hospital or nursing home. I think the problem is that most healthcare facilities – nursing homes and hospitals alike – really don’t grasp the BASICS of how to avoid and how to heal pressure ulcers. Most places cannot differentiate between an air mattress and an air overlay, much less what type of air mattress – alternating pressure, lateral rotation, low air loss, etc. that is actually needed based on the actual stage of the wound. They don’t understand why it’s not ok to use the cheapest skin care products, products that are not pH balanced for an elderly person’s skin. They have staff bringing in skincare products in little backpacks because someone let them run out of good products. What they bring in is bought locally and is not appropriate for skincare in a healthcare facility. They don’t understand why double-padding is not ok. They’re using baby powder which dries out the skin. Their Dietary Manager or Registered Dietician does not understand optimal use of nutritional supplements…other than house shake. Most facilities avoid the use of negative pressure (wound vacs) due to cost not realizing that the cost of continuing to have that wound is much, much more. In fact, most places I’ve seen do not even have a turn schedule in place to ensure residents are being turned to relieve the pressure. There is much education needed in the nursing home industry, but not many people who are actually qualified to give it.